The Ford Fusion, which we carry at Sheehy Ford of Warrenton, is a popular car for many reasons. It has the size that many are looking for, it can accommodate five passengers, and it's reliable. It also has several advanced features built into it. Those who think that more information is always better will appreciate the SmartGauge. It provides feedback in real time so that drivers can make adjustments. For instance, you can track data regarding fuel economy and battery power so that you can get the most of your engine components. Everything is easily read, thanks to a dual LCD display. The screens can even be configured to your preferences. 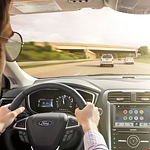 An optional feature that can come with the Ford Fusion is FordPass Connect. This subscription service allows the car to act as a Wi-Fi hotspot on the 4G LTE network. Up to ten different devices can access the Wi-Fi, and they can be up to fifty feet away.